In our series “Moments That Matter,” we share the amazing moments people experience while attending events. Whether it be an inspirational talk, the discovery of unexpected paths or meeting innovative encounters — whatever crossed your way, we at EventZebra want to share it with the world. Luciano and Antonio form a very young and passionate company, with the third member of their team, Alberto de la Rua. They didn’t have the chance to attend many events in the past. However, when we talked to them, they told us that exactly this event in Cologne, the Startupnight — Road to Berlin, is a very exciting moment. They’ve enjoyed the opportunity to “network and collect ideas from each other,” as Luciano told us. Despite that, the highlight was their interview with the ‘Kölnischen Rundschau,’ as well as being printed in an article afterwards. Click here to see the article. Attending B2B events will most likely broaden your horizon, and expand your network. These events will help you get to know really inspiring and interesting people. Who knows, the guy across the room with the blue shirt and rumpled blond hair might be your future co-working partner? Or the lady in the green dress sitting next to you might give you a new perspective on your business idea? Always stay open-minded and be excited for the unknown, talk to everybody you think might be interesting — you never know who is behind the facade. Working at DronOSS, their ARbox offers a world-first additional device for unmanned vehicles, which enables the wireless transmission of video signal and sensor data in real-time in distance. With that, they can interact with Augmented Reality via remote control. The free Open-Source Software provides users limitless freedom while developing their own innovative Apps for the ARbox. 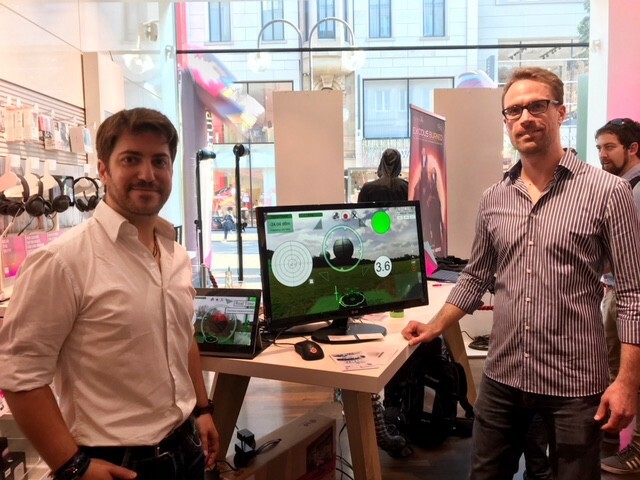 Luciano and Antonio attended the ‘Startupnight — Road to Berlin’ in Cologne at the Telekom Flagship Store, on the 28th of June. Here several Startups attended the event to present their groundbreaking ideas. As well as demonstrating their products, it was really engaging and exciting to actually experience the innovation of tomorrow. Afterwards, the Startups had the chance to pitch their ideas to a jury within 90 seconds, followed by an enjoyable networking opportunity. For more information about the event, click here. If you’re curious now about who those guys are and want to get more information about their amazing product, you can easily contact them via Facebook or via Twitter.